The bold print and matte texture of this necktie complements the more casual knit shirt and enlivens a classic knockabout cotton suit. Neckties are often thought of as dressier accessories, and indeed nothing completes the look of a well-cut business suit like a sumptuous silk four-in-hand. Certain types of ties, however, can be quite casual in their effect, and perhaps all the more stylish because they tend to be worn as a matter of pleasure rather than as part of what is often a mandatory uniform for work, weddings, or other more formal occasions. There are three main aspects of any given tie that determine its relative formality: pattern, texture, and color. As a rule of thumb, the less pronounced any of these attributes are in a tie, the dressier it is. Patterned ties, for instance, whether printed or woven, are considered dressy if the pattern is small and neat — an example is the iconic Hermès tie — but as the pattern grows bigger or more irregular, the tie becomes more casual. Boldly striped ties, for instance, have a jaunty air that can be worn with suits but pair best with tweed sportcoats and blazers that share their collegiate and military heritage. The neat pattern and smooth texture of Alan’s silk print tie perfectly integrates his dressy navy suit and crisp white shirt. The wide block stripes of Andrew’s tie harmonizes with the narrow stripes of the shirt in this classic navy blazer and cream slacks ensemble. A silver silk satin tie pulls together the shadow windowpane of the suit and the horizontal stripes of the shirt into a bold but elegant formality. Texture is an informalizing element. Woolen knits, crunchy silk knits, gauzy grenadines, slubby raw silks, nubby linens, and lofty cashmeres all have a more relaxed air that tends to look best when paired with shirts and odd jackets that have some texture themselves (e.g. oxford cloth button-downs and tweed jackets). By the same token, smoother ties like satin solids are best paired with sleeker suits. The rough linen textures of both this tie and patch-pocketed jacket impart a refined but relaxed feel. Rendered in lustrous silk satin and smooth worsted cashmere, the effect of this similarly monochromatic look is highly polished. The dressiest color for neckwear is no color at all: the highest ceremonies still call for formal white and semi-formal black bow ties. Next come silvery Macclesfield and Spitalfields neckties with their small, densely woven geometric patterns; best worn with dark suits, they are often referred to as “wedding ties,” and are well suited to such occasions. Dark jewel tones (e.g. navy, burgundy, bottle green) are classically dressy ties, and along with slightly more casual muted pastels, they constitute the majority of business-appropriate neckwear. Ties with bold, saturated colors can be pulled off by confident dressers, usually as part of more highly-styled ensembles (particularly in warmer months when color palettes tend to be brighter), but because they can easily overwhelm an outfit and distract from the wearer’s face, they should be approached cautiously. A silk seersucker tie gives this chic ensemble a subtle note of texture. The rough texture, large pattern, and bright colors of this playful silk/cotton tie complements the casual vibe of Alan’s bespoke linen trucker jacket. Because ties have long been marketed (incorrectly) as the one element of traditional male dress that allows for creative personal expression, many men see them as opportunities to “make a statement” — often involving a “pop of color” or some other attention-getting design. This approach will usually come off as unsophisticated. A tie is better understood holistically as an anchor in a man’s ensemble — a grounding centerpiece that pulls together the shirt, jacket, and pocket square into a cohesive, harmonious whole, focusing the eye and directing it upward. If a tie is an outfit’s punctuation, it shouldn’t be a question mark or an exclamation point, but a humble colon: presenting the wearer’s face rather than distracting from it. Jonathan’s subtle woven silk tie sharpens up a soft cashmere jacket into a highly business-appropriate look. Sartorial rules are of course made to be broken, and these guidelines are no exception. Any given necktie has attributes that vary across the ranges of relative formality described above, and most can be worn to different effects in different ensembles. In any case, part of the fun of sophisticated dressing is playing with unexpected combinations. To do so effectively, however, it’s important to know what each element bring to the party. The best dressers have an elegance that only looks accidental. 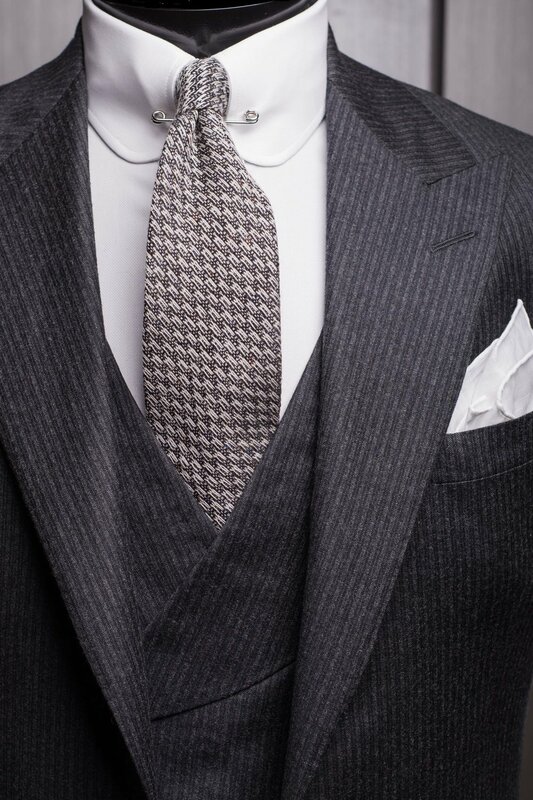 A heavily textured wool tie plays an unexpected but effective role in this highly formal monochromatic presentation.